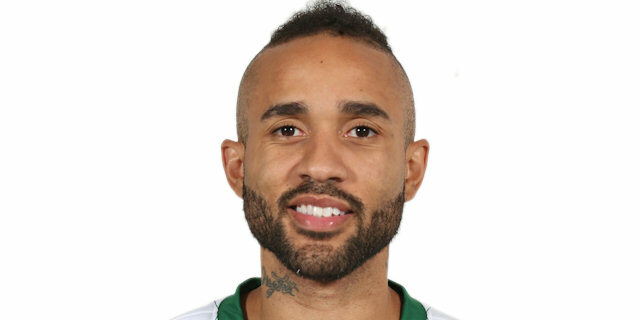 Laboral Kutxa Vitoria used a big third quarter to build a 15-point lead, then held on to beat Panathinaikos Athens 61-68 in the Greek capital on Friday night. The win snapped Laboral’s 7-game losing streak, improving it to 2-7 in Top 16 Group E and keeping its slim playoff hopes alive. 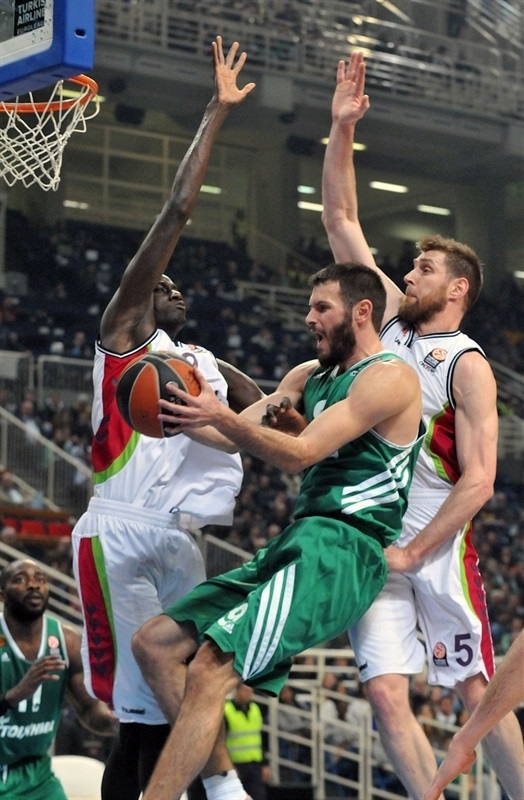 Panathinaikos has dropped five out of its last six games, and has 4-5 for a share of fourth place in the standings. Laboral led 27-28 at halftime after neither team held more than a 4-point lead in the first half, but its offense flourished in the third quarter. Led by Andres Nocioni and Tibor Pleiss, the visitors scored 27 points in the third quarter, opening up a double-digit lead. The margin was extended to 46-61 early in the fourth before the Greens rallied. 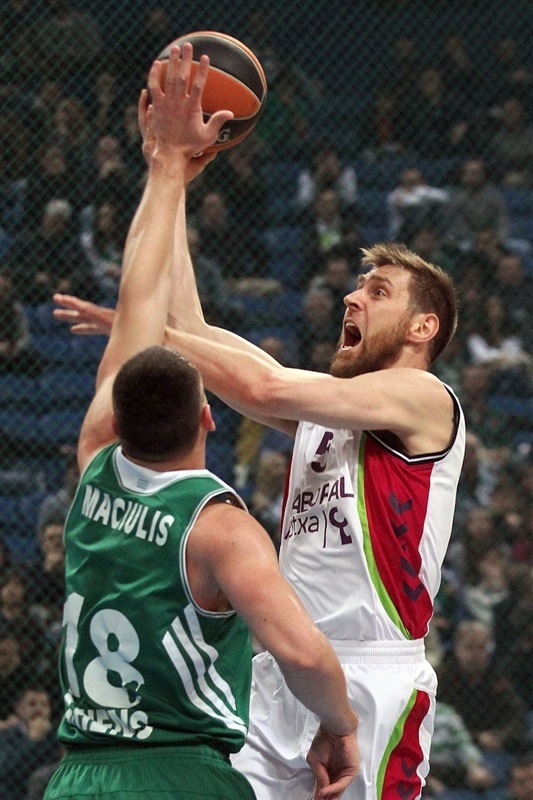 However, Laboral prevailed for its first win over Panathinaikos in Athens in almost 8 years. 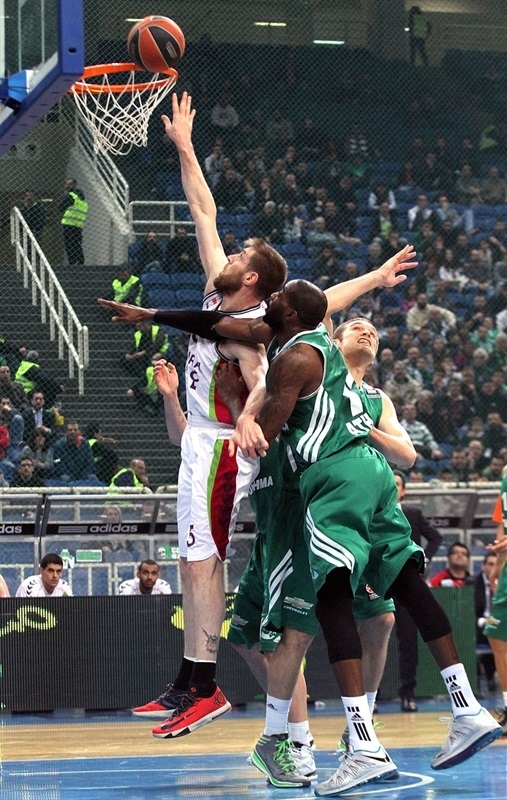 Nocioni paced the winners with 16 points, 13 rebounds and 2 blocks. Pleiss scored 12, while Fabien Causeur and Thomas Heurtel netted 9 apiece in victory. 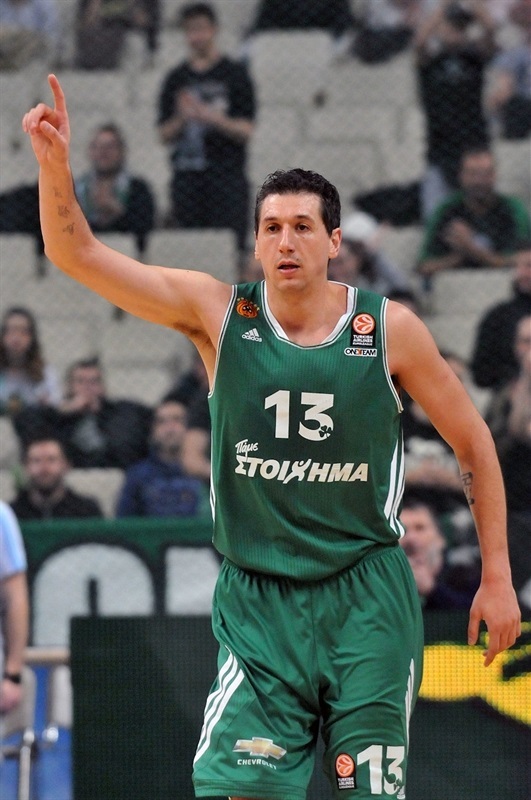 Dimitris Diamantidis led Panathinaikos with 15 points, Zach Wright scored 12 and Michael Bramos finished with 10 in defeat. 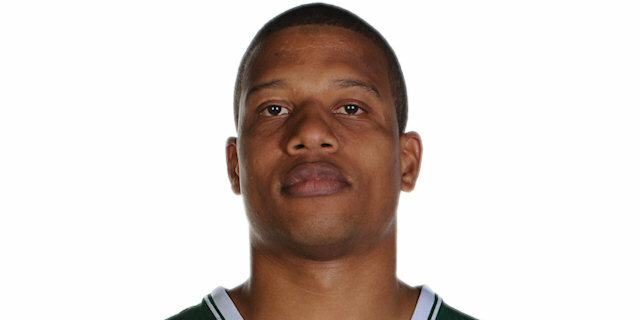 Roko Ukic opened the scoring with a floater for Panathinaikos before Nocioni hit a wide-open three for the visitors. Ukic delivered again, cutting through the paint for an easy layup, and after Heurtel answered with a fastbreak layup, Diamantidis got a lucky roll on a triple to put the Greens ahead 7-5. Nocioni drove for a layup on the other end, and after Diamantidis hit again from downtown for the Greens, a dunk from Pleiss and a floater from Heurtel put Laboral back in front, 10-11. Bramos opened his tally with a put-back for the hosts, but Nocioni sank another three-pointer to keep Laboral up. That only lasted until a baseline jumper from Antonis Fotsis tied it 14-14. 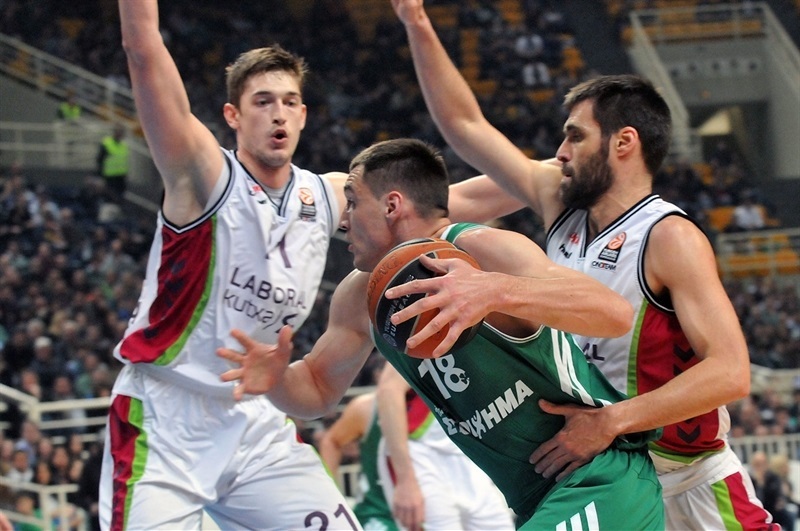 The teams traded baskets in the last 2 minutes of the quarter – Causeur and Nocioni scoring from close range for Laboral, while Wright drove for a pair of layups for Panathinaikos - to leave the scoreboard even, 18-18, after 10 minutes. Fotsis had a put-back and David Jelinek raced for a fastbreak layup for the first points for their teams in the second quarter. 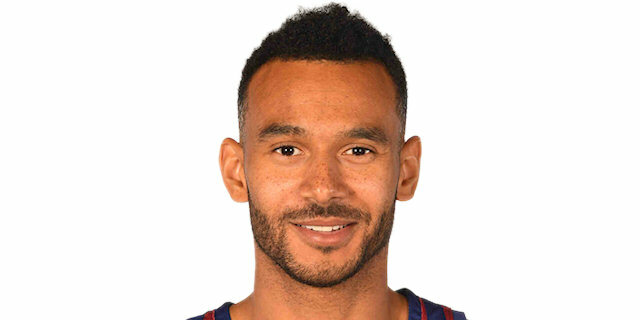 Adam Hanga hit a pair of free throws to put Laboral up 20-23 as the game lost some of its rhythm due to personal fouls and turnovers, while both teams kept their focus on the defensive end. Stephane Lasme ended the scoring drought with a layup, but Jelinek again raced the length of the floor, this time finishing with a dunk. Lasme answered with his own slam at the other end, but Jelinek was on a roll and again drove for a layup at 24-27. In the final minute of the quarter, Diamantidis hit 3 of 4 free throws to cut the difference, but Heurtel got a freebie of his own to leave Laboral in front, 27-28 at halftime. Pleiss and James Gist traded monster dunks to start the third quarter, and Pleiss followed with another one to make it 29-32. After Wright scored a layup, Pleiss assisted Causeur for a triple, but Gist answered with a layup in traffic and a fast break dunk to tie the game at 35-35. 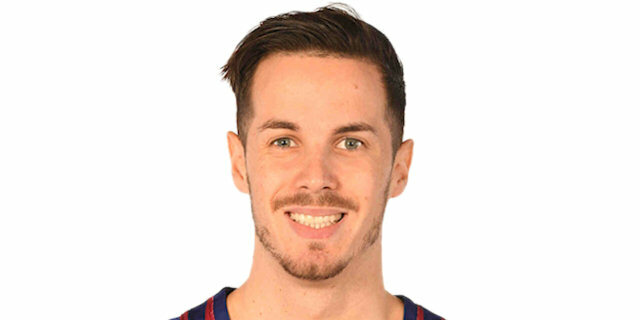 Nocioni scored a tip-in to put Laboral back in front and after Pleiss scored a layup-plus-foul, Nocioni buried his third triple for an 8-point edge. After a timeout, Bramos hit a three for the hosts, but Causeur scored a tough layup before Fernando San Emeterio sank a three-pointer and Pleiss added a layup that made it 38-50. Jonas Maciulis and Bramos hit back-to-back from downtown to snap a 3-15 run and quickly halve the deficit, but San Emeterio hit from long range again and Causeur drove for another layup to give Laboral a 44-55 lead. Hanga hit a floater to open a 13-point margin at the start of the fourth quarter. Wright drove for a layup, but Giuseppe Poeta hit a baseline jumper before driving for a layup that made it 46-61. 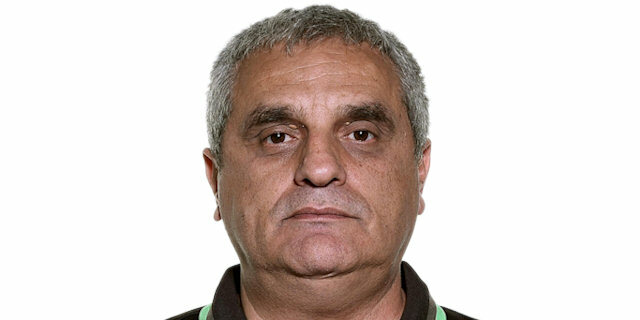 The hosts’ head coach Argiris Pedoulakis called a timeout, and Panathinaikos stepped it up on defense. After Diamantidis and Bramos each scored a pair of free throws, Pleiss fouled out and Maciulis scored a layup to get within 8. San Emeterio hit a short jumper to snap Laboral’s scoring drought, and Heurtel hit 2 free throws to make it a 12-point game. 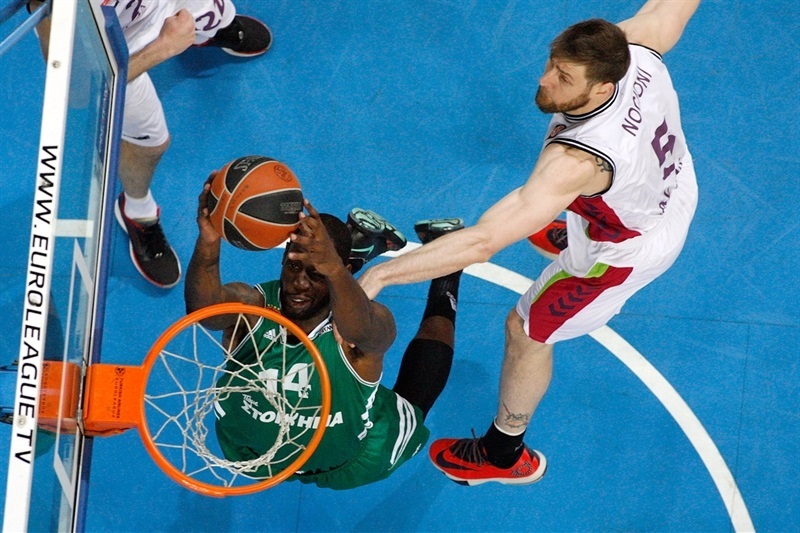 However, Wright drove to the hoop, and Diamantidis scored a layup-plus-free throw to close within 58-65 with 90 seconds remaining. Wright made a steal and raced for a layup, then a steal from Maciulis and a technical on Nocioni for flopping led to Diamantidis making a free throw to get as close as 61-65. The hosts had possession to edge even closer, but Leo Mainoldi stole the ball on the other end, and Heurtel sank both free throws 20 second before the end, sealing the outcome. "We played badly and we lost badly since we played without concentration and the needed desire. In the first half we missed open shots and then we allowed 27 points in the third quarter, which are too much as we didn’t use the fouls and allowed them to shoot and obtain confidence. Finally we found some energy and played better in the last period, but it was not enough. It is my responsibility. Now we must lift our head and try to be more effective. I have said that there are no easy games in the Euroleague and the proof of that is in front of us. 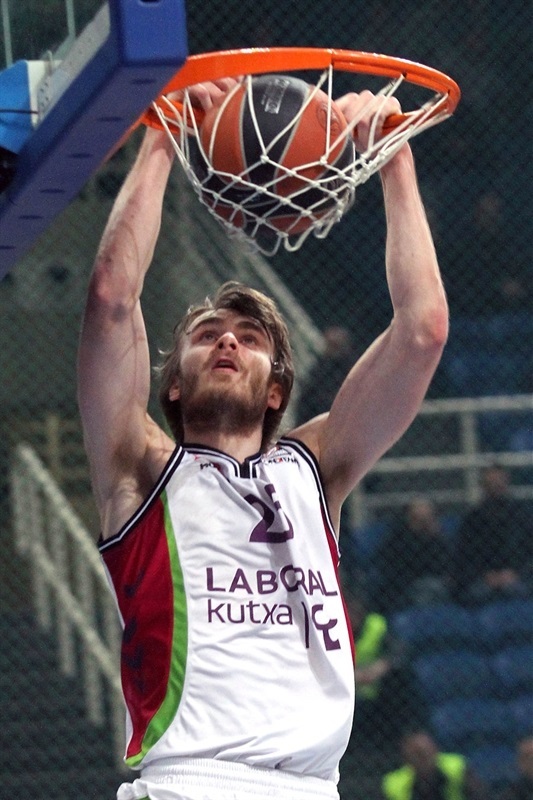 Laboral Kutxa came here to play basketball, as they had nothing to lose, but they are leaving with a big gain." "I am happy because we beat such a great team on the road. I don’t know if this victory will be valuable for our chances to advance to the quarterfinals, but it will be valuable enough for the team in the near future. We are the only Euroleague team that has no American player on its roster and we suffered a lot due to the consecutive losses. We were sad and lacked confidence, but after tonight’s success we can finally lift our heads and obtain self-confidence and a better psychology." "Laboral Kutxa started the game very well. They stayed focused on their style. The secret in such a game is to kill your opponent, if you have this possibility and we didn’t. We entered the court by thinking that they have no life anymore, but it was a fatal mistake. Now we have to suffer the consequences of this defeat. After the Greek League All Star Weekend, we will have the opportunity to work better and look forward. It is not time either to blame each other or to point fingers at who is guilty. The first priority and the key point for making the situation better is to stay together." "We started well in the first half, but in the second we had a slow reaction in defense and that was the reason they outscored us. Laboral Kutxa made some big shots, they keep extending their lead and took confidence. Nothing is decided yet. We have to work hard and get the wins we need, to advance to the playoffs. It is crucial for us to play to our standards and avoid the mistakes that cost a lot." "To be honest, we didn’t expect to play such a good game and get this victory. We are very satisfied with what we achieved tonight, because we came here with a 1-7 record and managed to beat Panathinaikos on their court. It has always been tough to play here and this gives us more credit. " "We were winless for a month and a half, so what we achieved tonight here is a big success and I hope that we can invest in it. We would like to recover and hopefully this is a good starting point, although it is late. We kept fighting as a team for 40 minutes and I think that our victory is clear and fair."